So I've been feeling a little guilty about crafting much less with Ariel than I did with Angel when she was this age. 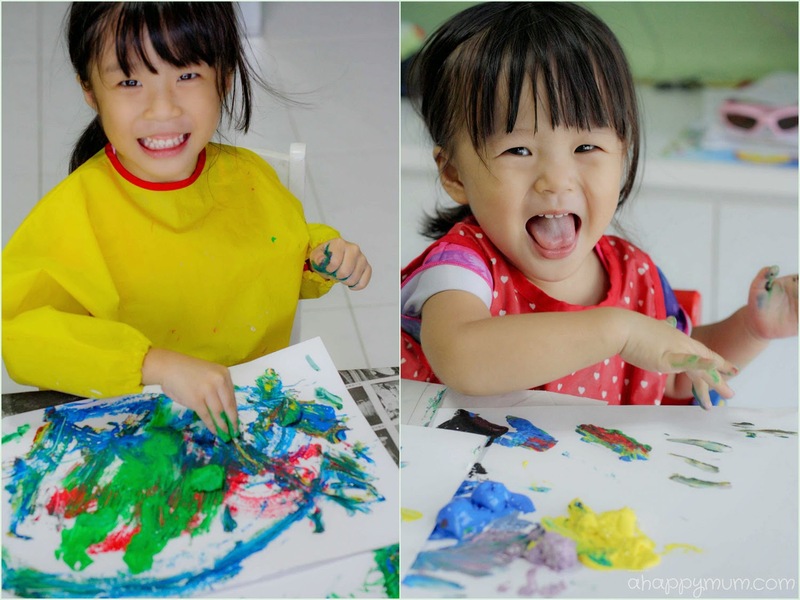 Thus, for this week's Creativity 521, I wanted to conduct an activity in which the little sister could participate in a no-holds-barred manner where she could be free to use her imagination, have fun splashing with colours and create a beautiful mess. Yes, I'm referring to PAINTING! In addition to the usual painting, I thought it would be great to have something not just fun but sensory as well, so we decided to try out ICE CUBE PAINTING! How did it turn out? Well, I would say it was really, really cool. Firstly, I poured in the paint until we achieved an assortment of colours in the ice cube tray. You can choose to mix colours and you can either combine them well by stirring, give a light and quick twirl so that the colours remain distinct, or make rainbow cubes by adding many colours without mixing. 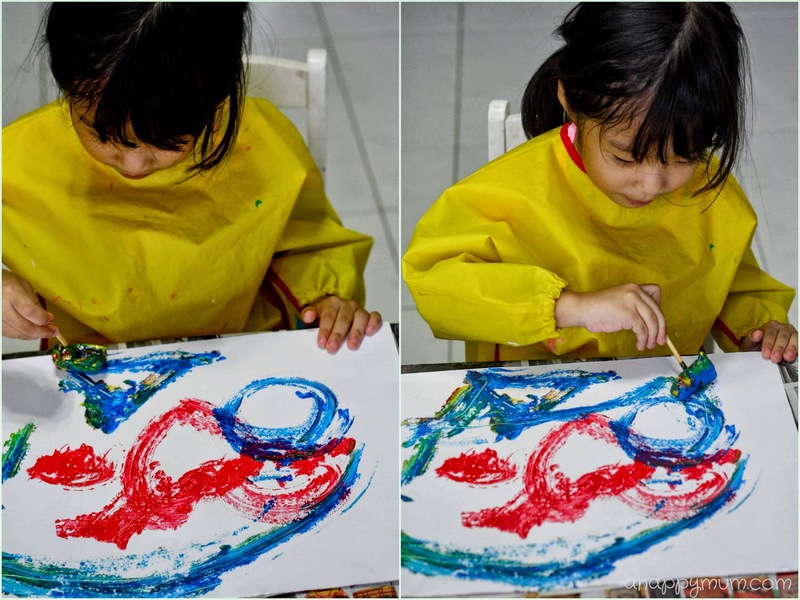 Tip: If you are using acrylic paint or other paint that is thick enough, you can add some water so as to save on paint. You would need to have a substantial amount of paint in each compartment so that removal becomes easier later on. Next, leave the paint in the freezer for 45 minutes to 1 hour before you insert the wooden sticks, ice cream sticks or even straws. For me, I found out that these sticks were redundant eventually because, well, read on and you'll see. Let the paint freeze overnight and when ready for use, remove them like you would for normal ice cubes. Tip: If you are really concerned about what goes into your fridge, use an ice cube tray with a lid and forget about the sticks. This tray was used for freezing puree when Ariel was younger and it now functions as a designated art and craft tray. After that, it's time for the fun to begin! If you have small kids, this could get quite messy so it would be best to lay sheets of plastic or newspaper on your furniture and dress the kids in old clothes and aprons. For us, at first, the ice cubes held on well and I was thinking "Hey, this is not as messy as I thought!" The girls had fun swirling the cubes around while holding the sticks and it wasn't a surprise that their favourite cube was the rainbow one (yes, I predicted that and made two). But before long, the ice cubes started falling apart and what I did not predict was that they tended to melt quite fast in our tropical climate. See, like I said, the sticks became useless. So when the girls gave sad looks and kept pointing to their halfway done drawings, I told them to carry on painting but this time round, no sticks, just fingers. You bet I saw twenty fingers jumping for joy instantly. 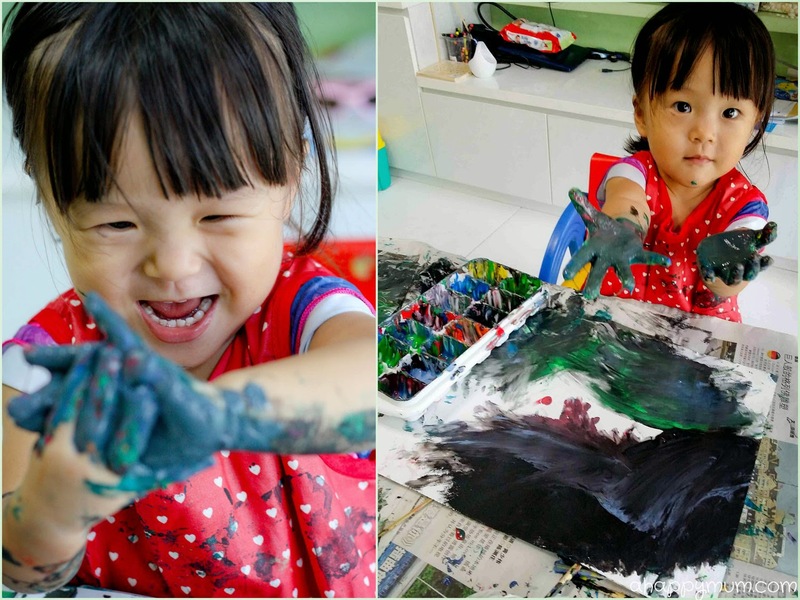 So, it ended up to be a fun and hands-on art session where the kids were smearing paint all over the drawing paper and giving out squeals of delight when they felt the cold ice. The good thing was that they used up every single drop of paint and had to reluctantly stop when we ran out of supply. Although this was more of an activity I wanted for the little one, it turned out that Angel had just as much fun too! See? 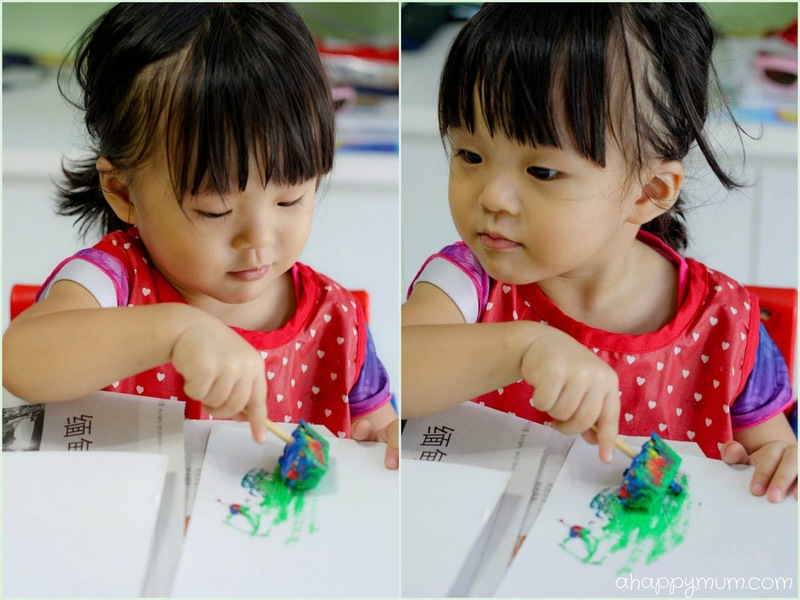 She even discovered that when the paint on her paper was thick enough, she could use the stick to make drawings and she even wrote all of our names on it. It's great to know that kids have their own thoughts and imagination, right? 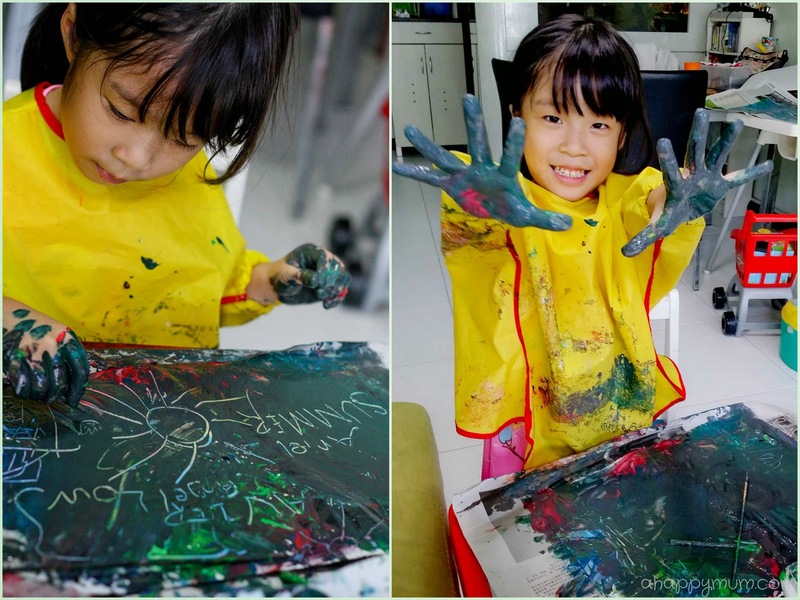 As for Ariel, well, these were her first finger painting artworks. They might look very simple but I think they would make great memories for us. As for those big smiles on their faces, priceless. Yay to our first experience with ice cube painting! Oh this is one of our favourite activities too! We do it with food colouring! Love the girls' happy faces in the photos!! Oh cool, we should try with food colouring too to save $$! It may not be as thick as the paint but should be just as fun! =) Thanks for telling me! Thanks for the idea! It looks fun and wont they be mistaken as ice Popsicle? Ha. I shall go search for an ice tray now.